Studying Dutch legal history is traditionally called studying Old Dutch law. No nationalism is implied in this word, for dealing with it means studying a lot of varying regional and local legal systems. Apart from that, one has to see whether one is interested not only in the present Netherlands, but also in its sometime southern part, Belgium. Anyway, the Dutch word oud-vaderlands recht can be used for both Dutch and Belgian legal history. To the legal history of the Netherlands and Belgium one has to add the colonial past: Indonesia, Suriname and the Dutch Antilles in the Caribbean, South Africa, Sri Lanka and Congo are among the countries involved. One can consult some major collections for the old printed sources of and concerning the old Dutch law, such as law books, statutes, ordinances, collections of ordinances and placards, and collections of sentences or juridical advice. On the spot or nearby these libraries there is in most cases a collection of the relevant scientific literature on Dutch legal history. The collection of E.M. Meijers (1880-1954) was housed for many years at the Legal History Institute of Leiden University at the old Count’s Prison, the “Gravensteen”, but now one can find it at Leiden University Library – catalogue : R. Feenstra, M. Duynstee and W. Schwab (eds. ), Catalogue des imprimés de la collection Meijers de la Bibliothèque de l’Université de Leyde (Leiden-Zwolle 1980). The collection of old imprints at the Hoge Raad, the Dutch Supreme Court in The Hague, contains a large number of books for Dutch legal history, see the catalogue – P.P. Schmidt, Catalogus Oude drukken in de bibliotheek van de Hoge Raad der Nederlanden (Zwolle 1988) – and Joost Pikkemaat, The Old Library of the Supreme Court of the Netherlands (Hilversum 2008). At the Law Library of Utrecht University there is a sizable collection of old juridical books, amounting to some 3000 books – a succinct overview of them is to be found at the website of Utrecht University Library. Outside the Netherlands one should in particular consult the library of the Max-Planck-Institut für europäische Rechtsgeschichte, Frankfurt am Main, which houses a very large collection of old Dutch juridical books, see Douglas Osler, Catalogue of books printed in Spain, Portugal and the Southern and Northern Netherlands from the beginning of printing to 1800 in the library of the Max-Planck-Institut für Europäische Rechtsgeschichte (Frankfurt am Main 2000). The Herzog-August-Bibliothek in Wolfenbüttel is another German library with rich holdings of Dutch books. One could also recommend some British libraries, starting perhaps with the British Library and its Dutch department. In Paris the Bibliothèque Nationale de France and the Bibliothèque Cujas of the Université Paris I-Sorbonne provide a sensible starting point, as do in Italy the Biblioteca Apostolica Vaticana and the library of the Archiginnasio in Bologna. The study of the Old Dutch law has been furthered in particular by some learned societies. Already at the end of the eighteenth century the society Pro iure patria excolendo was founded in Groningen. In 1860 the Vereeniging tot beoefening van Overijsselsch regt en geschiedenis (VORG, the Society for Overijssel’s law and history) was founded. For Gelre (Guelders) the Vereniging Gelre (founded in 1897) published a number of legal sources and studies. On a more national level the Vereeniging tot Uitgaaf der Bronnen van het oud-vaderlandsche recht came into existence in 1879. Nowadays it is a chartered foundation, often abbreviated as OVR. OVR published its own journal, the Verslagen en Mededeelingen, of which two series appeared. Since 1999 OVR has got a new journal, Pro Memorie. OVR supports the edition of sources for legal history in their Werken (Works), of which the fourth series is appearing now. Lately OVR has supported the publication of procesgidsen, a number of guides to legal procedures at several Dutch courts. Many older editions of Dutch municipal statutes published for OVR have been digitized in the wake of the project for the Deutsches Rechtswörterbuch. 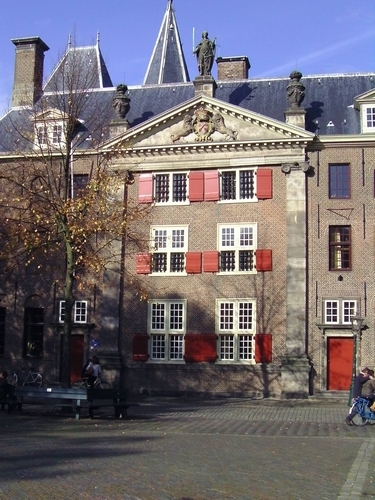 A special place was occupied by the former NCRD, the Dutch Center for Documentation in Legal History and Iconography in The Hague, housed in the Royal Library. Each of the departments of legal history in the Dutch and Belgian universities has its own specialties in subjects, periods and themes. The Tijdschrift voor Rechtsgeschiedenis, too, has been an important vehicle for articles on Old Dutch law ever since its first appearance in 1918. A number of more or less classic introductions exist. Traditionally universities put one or two of them on the reading program of students. The order here is purely alphabetical on author name. A.S. de Blécourt [revised by H.F.W.D. Fischer], Kort begrip van het oud-vaderlands burgerlijk recht (8th ed., Groningen 1968). P. Gerbenzon and N. Algra, Voortgangh des rechtes. De ontwikkeling van het Nederlandse recht tegen de achtergrond van de Westeuropese cultuur (5th ed., Alphen aan den Rijn 1979). E.J.J. van der Heijden [revised by B.H.D. Hermesdorf], Aantekeningen bij de geschiedenis van het oude vaderlandse recht (8th ed., Nijmegen-Utrecht 1968). B.H.D. Hermesdorf [published by P.J. Verdam], Rechtsspiegel. Een rechtshistorische terugblik in de Lage Landen van het Herfsttij (Nijmegen 1980). J.Ph. de Monté ver Loren [revised by J.E. Spruit], Hoofdlijnen uit de ontwikkeling der rechterlijke organisatie in de Noordelijke Nederlanden tot de Bataafse omwenteling (7th ed., Deventer 2000). G.W.F. Brüggemann and E.C. Coppens, Bibliografische inleiding in de Nederlandse rechtsgeschiedenis van de negentiende eeuw (Zutphen 1985). A fine annotated introduction in English to Dutch legal history is the chapter by Randall Lesaffer, ‘A short legal history of the Netherlands‘, in: Understanding Dutch law, H.S. Taekema (ed.) (The Hague 2004) 31-58. For the legal history of Belgium it is useful to read an article by Dirk Heirbaut, ‘Legal history in Belgium’, Clio@Themis 1 (2009). J. Monballyu, Six centuries of criminal law : history of criminal law in the Southern Netherlands and Belgium (1400-2000) (Leiden 2014) – first edition: Zes eeuwen strafrecht : de geschiedenis van het Belgische strafrecht (1400-2000) (Leuven 2006). R. Reinsma, Glossarium van XVe en XVIe-eeuwse rechtstermen ontleend aan sententiën en dossiers van de Grote Raad van Mechelen (Amsterdam 1967) – focusing on records of the Great Council of Malines. M. van Hattum and H. Rooseboom, Glossarium van oude Nederlandse rechtstermen (Amsterdam 1977). N. Wijdeveld, M. van Hattum and R. van Answaarden, Glossarium van oude Franse rechtstermen (Amsterdam 1983). The Dutch Royal Library has created a new overview of Dutch digital projects (PDF) where you can find not only books, but also maps, journals, newspapers, images and graphic materials. Digitaal Erfgoed Nederland [Digital Heritage Netherlands] has an online database for searching Dutch digital projects. The Huygens Instituut / Institute for Dutch History has digitized a large number of its publications in searchable online versions.